The Burghers of Calais depicts an episode from the history of the Hundred Years' War. In 1347, after the city of Calais had been under siege for eleven months, six prominent citizens offered their lives to the English king, Edward III, in return for his promise to spare the city. Upon hearing of their bravery, Queen Philippa interceded and obtained their release. 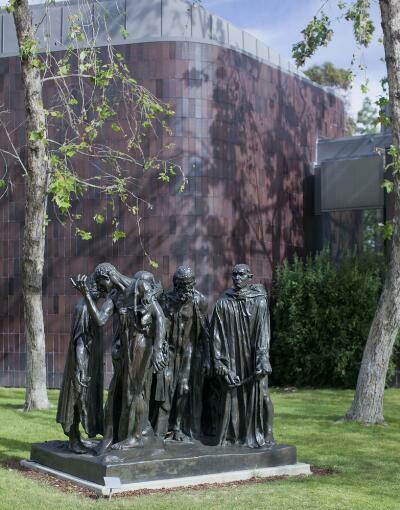 In 1884, Rodin was commissioned by the city of Calais to produce a monument honoring the six burghers. Rodin rejected the established conventions of public sculpture and portrayed the men not as glorious heroes, but as troubled and isolated individuals brought together by their anguish and common purpose. He depicted the emaciated figures departing, dressed in tattered sackcloth, to surrender themselves to the English army. Features and proportions are distorted to intensify the expressiveness of the figures struggling with their conflicting thoughts of fear, indecision, anguish, and nobility.